In England's Lincoln Cathedral you can visit the grave of "Little St Hugh". This lad was found dead and a story was circulated that he had been the victim of a Jewish ritual killing. This was used to fuel persecution of the Jews. His tomb in Lincoln Cathedral carries the story, but a notice has more recently been placed by the memorial, explaining the falsehood of the story. However the Blood Libel enjoyed great popularity and surfaced many times around medieval Europe and into the twenty first century. 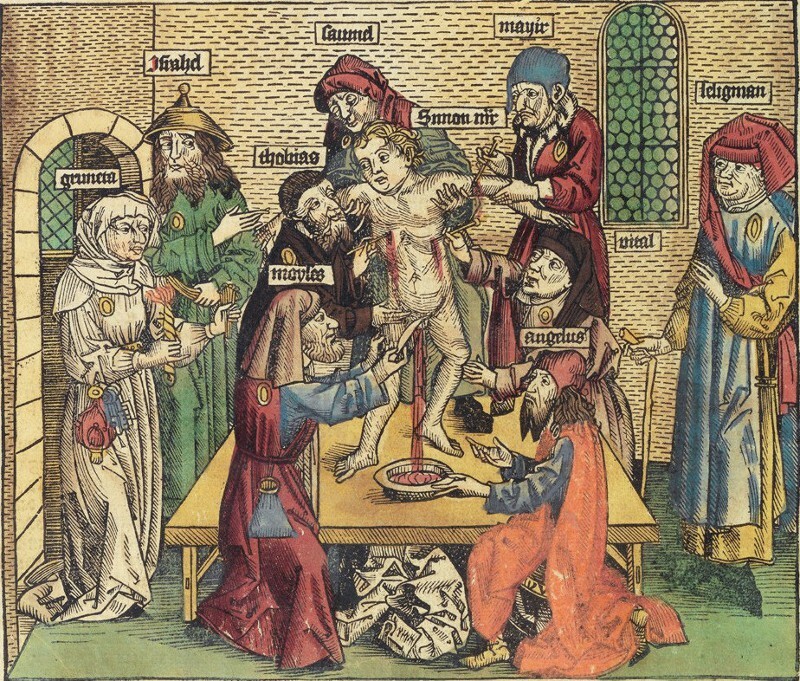 The medieval "Blood Libel" is still alive and well. Whilst recounting a string of lies may not be very edifying, it is instructional to see how a malicious lie can keep growing and spreading over the centuries. The Palestinian Authority is intensifying its longstanding blood libel campaign against Israel, falsely accusing Israel of conducting horrific Nazi-like medical experiments on Palestinian prisoners. These fabrications have been featured repeatedly in the Palestinian Authority's official newspaper, Al-Hayat Al-Jadida, which is under the direct authority of Mahmoud Abbas. Giving voice to blood libels and slandering Israel are essential tools used by the Palestinian Authority to demonize Israel and to inflame hatred against Israel, especially on the highly sensitive subject of Palestinian prisoners. It is therefore not surprising that the Palestinian public places the release of Palestinian terrorists from Israeli prisons as a national cause, and justifies all means -- including the abduction of Israeli soldiers - to free the prisoners from their supposed mistreatment. "Yasser Arafat was murdered by Israel"
Nine years earlier, on November 11, 2004, Yasser Arafat died. That he could have died from natural causes or some “lifestyle disease” was too unpalatable for his followers so they came up with a rather bizarre theory that he was poisoned with Polonium-210, borrowing the story of the only detected and recorded deliberate case of Polonium-210 poisoning - the fatal poisoning of former Russian spy, Alexander Litvinenko who died in London on 23 November 2006. After Arafat had been decomposing in Ramallah for eight years, his wife and followers dug up his corpse to try to prove it their claim. But this is Junk Science, since all of the Polonium-210 (half life 138 days) alleged to have been in his body would have decayed to undetectable levels in eight years. Even if he had been poisoned this way, it would more likely have been by Arabs who were able to get close to him. As Turkey turns against Israel (and Europe that rejected it) Turkish state TV broadcasts Blood Libel.. TRT1 broadcast a mini series Ayrilik looking at the life of a Palestinian family. In the programme, Israeli soldiers repeatedly murder Palestinian children in cold blood, and in one scene line up around ten innocent Palestinian civilians and mow them down with automatic rifle fire. 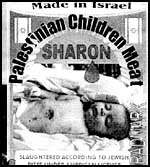 The government newspaper Al-Ahram, ran a lengthy article on October 28th 2001 explaining how "bestial" Jews murder Arab children to drain their blood to make Passover matzah, and that every devout Jew must eat one of these blood matzot to be allowed to live in the Jewish holy cities. There is a great difference between what the Arab nations and Palestinians broadcast in their own media and what they supply to the Western media. It appears that few in the West monitor the Arab media or take notice of the agencies that do! Mustafa Tlas, Syria's Minister of Defence published his version in Damascus in 1983, entitled, "The Matzo of Zion". 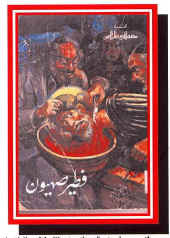 This book discussed in great detail the Damascus Blood Libel of 1840 and applied it to the current situation; concluding that, "no Arab country should ever sign a peace treaty with Israel" and that this was the final mistake of Anwar Sadat, who "sold his country to the devil". "Zahra's Blue Eyes." by Sahar 1 TV (Iran) was first broadcast December 13, 14 and 20, 2004. It is set in Israel and the West Bank and was filmed in Persian but subsequently dubbed into Arabic. 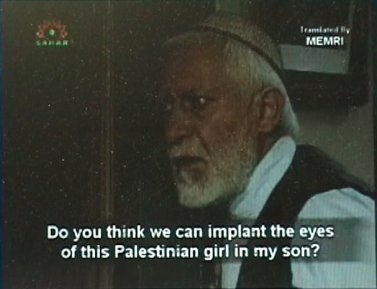 In Episode 1, Israelis disguised as UN workers visit a Palestinian school, ostensibly to examine the children's eyes for diseases, but in reality to select which children's eyes to steal to be used for transplants. The story follows an Israeli candidate for Prime Minister, Yitzhak Cohen, and contains graphic scenes of surgery, and images of a Palestinian girl in a hospital whose eyes have been removed, with bandages covering the sockets. This poster was produced by students at San Francisco state university as part of the escalating campaign of anti-Semitism around the world. It appeared in May 2002. Much has been written about how the Rachel Corrie case was handled in the courtroom. Yet all the while, a more subtle judgment has been taking place in the court of public opinion. If Corrie was indeed standing with a megaphone and fully visible at the moment she was crushed, it is difficult to believe that the Israeli driver failed to see her. The CNN report is a lie. 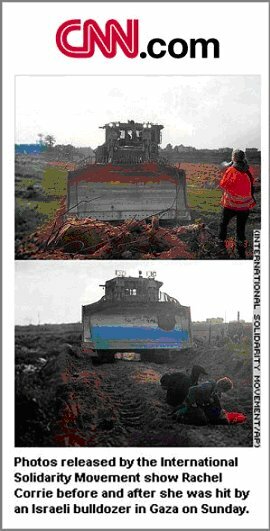 Any honest journalist can see that this second photo shows a different bulldozer. Note the large mud spot on the right side of the bulldozer’s blade. Additionally, this second bulldozer has smaller windows and an 8-foot-tall bulldozer blade that greatly obscures driver visibility. Look carefully at the pattern of bends in the grid at the tops of the bulldozer blades; (The full size pictures are on the web page linked to above) they are not the same! If the location is the same, a lot of earth has been moved between the two pictures being taken. CNN’s misleading photo and caption cannot be passed off as merely an honest mistake. A leading Swedish newspaper reported this week that Israeli soldiers are abducting Palestinians in order to steal their organs, a claim that prompted furious condemnation and accusations of anti-Semitic blood libel from a rival publication. "They plunder the organs of our sons," read the headline in Sweden's largest daily newspaper, the left-leaning Aftonbladet, which devoted a double spread in its cultural section to the article. But the liberal Sydsvenskan - southern Sweden's major daily - had harsh criticism for the rival paper, running an opinion piece under the headline "Antisemitbladet" (a play on the name Aftonbladet). "We have heard the story before, in one form or the other. It follows the traditional pattern of conspiracy theory: a great number of loose threads that the theorist tempts the reader to tie into a neat knot without having been provided with any proven connection whatsoever," writes leading columnist Mats Skogkr of Sydsvenskan. "Whispers in the dark. Anonymous sources. Rumors. That is all it takes. After all we all know what they [the Jews] are like, don't we: inhuman, hardened. Capable of anything," the opinion piece says. "Now all that remains is the defense, equally predictable: 'Anti-Semitism' No, no, just criticism of Israel." This latest blood libel joins an all too long list of false charges and accusations against Israel and the IDF and would not look out of place on a neo-Nazi website or the pages of the infamous Protocols of the Elders of Zion. While this article may have been published in Swedish, previous experience shows that even such outlandish stories take on a life of their own as translations appear on the Internet preserved for Israel's enemies to dig up in the battle to delegitimize and demonize the Jewish state. Even though credible rebuttals may appear, as was the case with the Jenin "massacre" and The Independent's "secret uranium bombs" (see HonestReporting's Big Lies interactive resource), these stories continue to fester online and, sadly, it is likely to be the case with Aftonbladet's disgraceful article. To make the point how such libels have a willing audience, particularly in the Arab world, MEMRI republishes this cartoon - Israelis Steal Palestinian Martyrs' Organs, Trample Human Rights Charter - from a Qatari newspaper. The editor of the Swedish newspaper Aftonbladet admitted on Monday that his paper does not have evidence to confirm the story alleging Palestinians were kidnapped by IDF soldiers in order to steal their organs. Yesterday, editor Jan Helin wrote a column defending the initial report as a story that "should be investigated, either to stop the relentless Palestinian rumors, or, if the rumors prove to be true, stop the trade in body parts." The follow-up article included a front-page photo of 19-year-old Bilal Ahmad Ghanem, from the West Bank village of Imatin, who was killed during a clash with Israeli soldiers in 1992 and his body was returned with a scar running from the neck down to the abdomen. Soldiers said the body had undergone an autopsy, but the family claims Bilal's organs had been stolen. Meanwhile, Israeli Prime Minister Benjamin Netanyahu insisted yesterday that, "We do not want the Swedish government to apologize, we want it to issue a condemnation." Al Roth, the Harvard economist whose work on matched-pair organ donations has started to transform the organ-transplantation scenario, told me he found the accusation unbelievable because of the logistics of organ harvesting itself. "Organs don’t last very long and have to be matched rather particularly," he said, "so it would be hard to take them on spec for an international market. So I think black market organs must mostly be from live donors. Live donors can take blood tests well in advance and travel to where the patient is. Deceased organs have to be put on ice, and the clock starts ticking immediately and fast." Canadian investigative journalist Terry Glavin recently (Jan 2010) reported on an odious story that British Columbia Muslim newspaper Al-Ameen Post had carried, which "reported" on an alleged Israeli conspiracy to kidnap 25,000 Ukrainian children in order to harvest their organs. The report was entitled "Ukrainian kids, new victims of Israeli organ theft." Glavin aptly noted that this report was "reprinted faithfully and accurately from the holocaust-denying international Press TV, which is the house journal of the Khomeinist tyranny in Iran." Press TV had reported these outrageous allegations as if they were fact and Al-Ameen had simply republished this report without doing any rudimentary fact checks. Even when Israel puts itself on the front lines of medical and humanitarian aid sent to the ends of the earth (January 2010) and wins praise for its professionalism in doing so, there are those who prefer to transform the act into an opportunity to spread hatred and lies at the expense of those suffering in Haiti. There is no sign of any claims to have evidence, just libellous personal opinion, but see how it propagates. The Apartheid libel is similar in origin and effect. 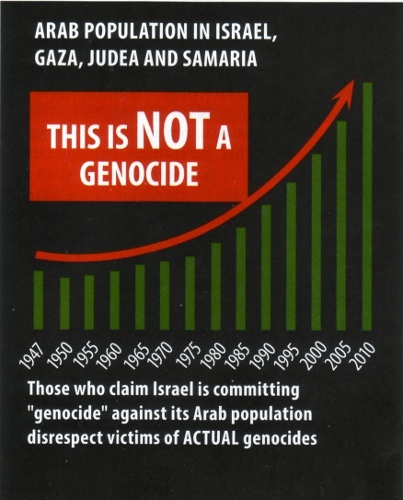 "Israel is conducting Genocide or Ethnic Cleansing against the Palestinians"
Too ridiculous to even be considered, but many believe it so graphs have been produced to demonstrate the facts. Graphs used with permission of israel today magazine - produced by Israellycool. 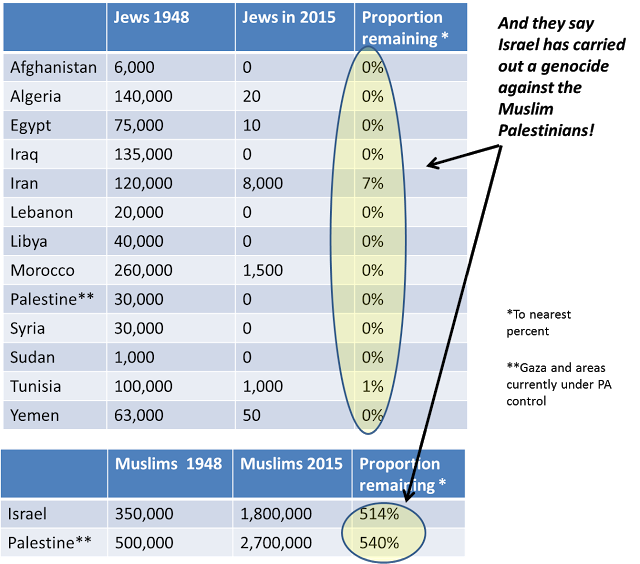 Or, looked at in comparison to what has happened to Jewish populations in Arab lands. The Problem is . . .
Once a Blood Libel has been launched, it has a life of its own and reappears in new and more grotesque forms, such as the one propagated by British MP, George Galloway in a column for Scotland's Daily Record. But the revelation in the Israeli parliament in recent days that the body parts of Palestinian prisoners were systematically harvested without the knowledge or consent of their families has had an impact in these parts which it is difficult to overstate. When the story first broke, on Swedish TV, I frankly did not believe it. Implacable critic of Israel as I am, it was beyond belief that a country calling itself the "Jewish State" could ever do such a thing. I met the correspondent responsible for the story months ago and rigorously questioned him about it. I was not satisfied, and didn't use the information. The man was offended and I owe him an apology. Israel has admitted this evil, wicked crime and declared it no longer practises it. While it is to their credit that they have stopped it and even more creditable that at least within their own people robust freedom of the press and parliament has allowed the truth to come out, there is little evidence of national soul searching of how such a thing could happen. Still less of anyone being held accountable for playing mini-Mengele on Palestinian prisoners in Israeli jails. 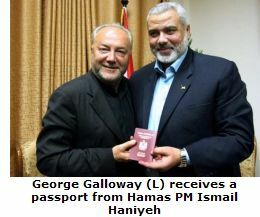 Galloway has deliberately distorted two separate stories in order to slur Israel. Swedish journalist Donald Bostrom's blood libel has already been thoroughly debunked and deconstructed. However, the dangers posed by such a libel have already been proven. Since the article went to print, rumors of Israeli organ-harvesting surfaced in Ukrainian elections, were an excuse to ban Israeli doctors from an Egyptian medical conference, and brought at least one pseudo-journalist crawling out of the woodwork with copycat claims. The recycling, however, of an old and unrelated story has added fuel to the fire for Galloway and others who seek to demonize Israel. There was actually no linkage to Bostrom's false allegations, which libelled the IDF. The Abu Kabir scandal did not target Palestinians. Israeli soldiers, civilians, Jews, non-Jews as well as Palestinians were the victims of a domestic scandal that was discovered and dealt with by the Israeli authorities to ensure that such ethical lapses would not be allowed to reoccur. 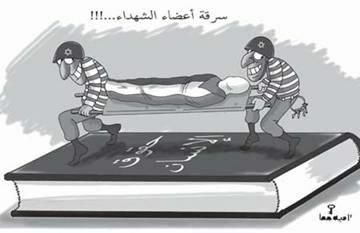 The wording, "body parts of Palestinian prisoners were systematically harvested" infers organs were removed from living people! In the worst tradition of Blood libels. The "harvesting" was done by a Pathologist - pathologists work on the dead, not the living. There was no systematic organ harvesting of Palestinian prisoners in Israeli jails or, indeed any systematic organ harvesting of Palestinians - the allegation is simply a libel . While Galloway attempts to cover himself by referring to the uniqueness of the Holocaust, it is clear that he is deliberately making a comparison between Israel and the Nazis. Comparing Israel to the Nazis or attempting to draw false parallels with the deliberate genocide of 6 million Jews during the Holocaust is a tactic regularly deployed by anti-Israel activists despite being classified as anti-Semitism under the EU's own working definition. In late 2010 there were a number of lethal shark attacks, resembling the storyline of the movie "Jaws", on tourists at the Egyptian, Red Sea resort of Sharm el Sheik . Egyptian national TV helped spread rumors, based on the questionable testimony of a local diver who told the popular TV program "Egypt Today" that the white tip sharks involved in the attack are ocean sharks which do not live in Egypt's waters, and further speculated that the sharks were implanted with GPS tracking devices controlled by the Mossad.